Nvidia is at the SC13 supercomputing conference at the Colorado Convention Center all this week and kicked off the show today by announcing the “world's highest performance accelerator ever,” the Nvidia Tesla K40 GPU accelerator. This accelerator card contains twice as much memory as its predecessor and is expected to enable new kinds of accelerated apps. 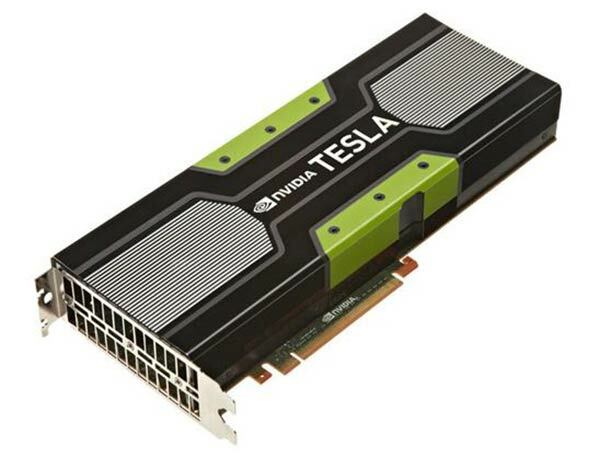 The Nvidia Tesla K40 GPU accelerator is aimed at speeding up scientific, engineering, high performance computing (HPC) and enterprise applications. According to Nvidia’s own figures the new K40 achieves up to 40 percent higher performance than its predecessor, the Tesla K20X GPU accelerator. Also, comparing it to the fastest CPU available today, it offers 10 times the performance. These qualities make the K40 an optimal choice “for big data analytics and large-scale scientific workloads,” we are told. 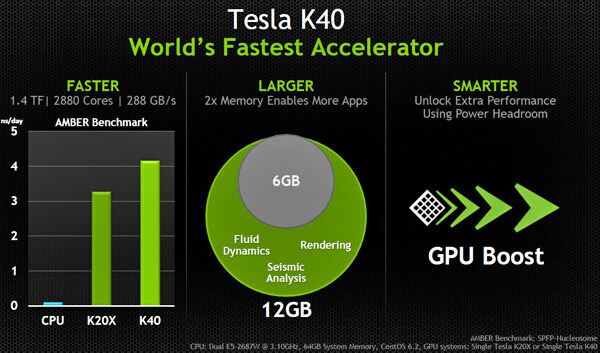 Like the desktop graphics cards from the green team the Tesla K40 also employs Nvidia GPU Boost technology. The new accelerator is based upon the Kepler architecture. Nvidia boasts that the Tesla K40 GPU accelerator “surpasses all other accelerators on two common measures of computational performance: 4.29 teraflops single-precision and 1.43 teraflops double-precision peak floating point performance”. Coinciding with this launch news Nvidia informed us that the Texas Advanced Computing Center (TACC) at The University of Texas at Austin is readying a new interactive, remote visualization and data analysis system called ‘Maverick’. This Tesla K40 based system will be fully operational at the beginning of next year. The Tesla K40 GPU accelerator starts shipping today. Nvidia will be resident at SC13 Colorado booth #613 to talk about this and other tech until Thursday at 3pm. If you pop by the booth tonight you can enjoy a glass of Liquid Green, an NVIDIA special cocktail. In other related news Nvidia and IBM have announced a partnership to develop GPU-accelerated versions of IBM's wide portfolio of enterprise software applications on IBM Power8 processor based systems. This will help migrate Nvidia’s GPU accelerator technology from supercomputing to enterprise-scale data centres. “This partnership will bring supercomputer performance to the corporate data center, expanding the use of GPU accelerators well beyond the traditional supercomputing and technical computing markets,” said Ian Buck, vice president of Accelerated Computing at Nvidia. I'm pretty sure just last week AMD revealed a new 12Gb card, do nvidia have a mole at AMD perhaps ?? The 780Ti is probably based on this. Well, lets see. GK110 die utilising full 2880 shaders? Yup, that's the 780 Ti. I guess partners might slap up to 6GB RAM on a 780 Ti, but actually virtually no games will use it at the minute. If there are any games running 3x 4K then you would use it (with 3 way SLI).